When it comes to wedding venues, the italian ones are the most searched and wanted. One is particularly the most desired: Lake Garda. This lake is the biggest one in the Italian territory and certainly the most famous. Located half-way between Milan and Venice, the Lake Garda has a mild climate and a variety of venues and there are many towns on is shores. 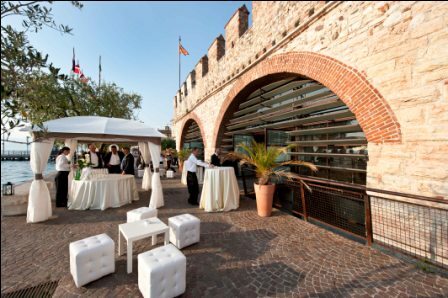 Desenzano is a town on the south-west shore and Peschiera is on the south-east side, but they are both really close to Verona and Milan, cities make a trip either for a cultural or shopping trip. If you want a romantic, breath-taking wedding experience, weddings in the lake Garda are perfect for you. There are a variety of scenery and settings, from mountains and cliffs to the southern countryside. Garda is a very distinctive town, with beautiful Venetian villas and the Punta San Vigillio, at the end of the lakeside path. The weddings are held in the town hall, a celebration room is on the 1st floor of this building which is located on a square in the centre of the town, very near the lakeside. Malcesine is famous for the Scaglieri castle perched on a cliff overhanging the lake. Monte Baldo is a mountain located near the town and it’s the highest mountain in the Lake Garda area. If you are a sport enthusiast Lake Garda is perfect for you too: sailing, mountain biking, horse riding, climbing, golf are the activities that you can practice in this beautiful setting. If you are into trekking uou can choose itineraries offering stunning views of Lake Garda, like the one on Monte Baldo, or the Treks of the Emperor’s Forts, the historical routes of the First World War.